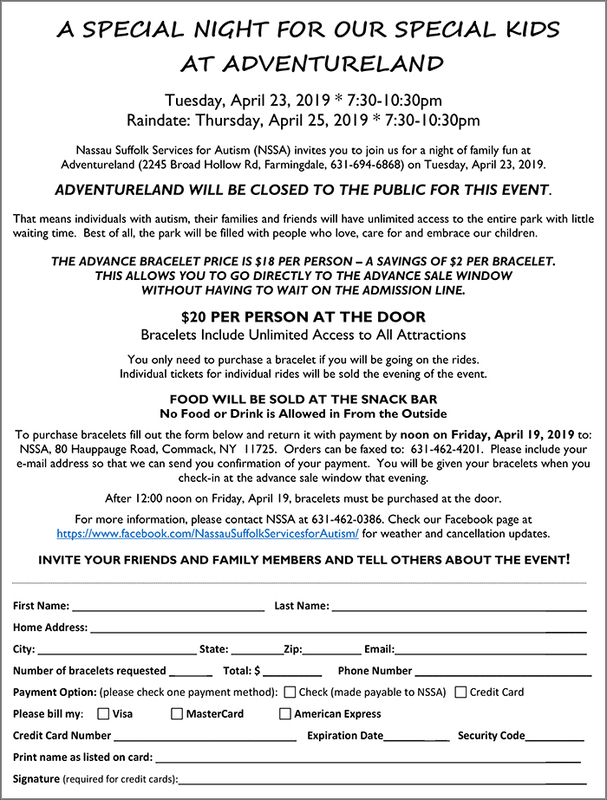 NSSA’s A Special Night for Our Special Kids will take place at Adventureland in Melville, NY on Tuesday, April 23, 2019 from 7:30-10:30 pm. Raindate: Thursday, April 25, 2019 from 7:30-10:30 pm. Nassau Suffolk Services for Autism offers hope to people with autism and their families by providing high quality life-long support through services which enable people with autism to function better in everyday life. NSSA offers the most advanced treatment and training programs for the benefit of people with autism, and will continue to pioneer, through research, comprehensive treatment models which can be adopted nationally. Copyright © 2013 NSSA. All Rights Reserved.